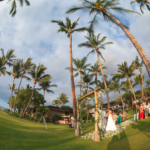 Jennifer and Joel were married at the Four Seasons Resort Hualalai on the Big Island of Hawaii. The chose the famous wedding tree location at the resort. We started with getting ready shots in the room; detail shots of the dress and rings, bride in room, and candids of friends and family. During the ceremony the bride and groom did a dove release. 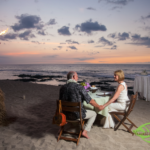 The reception was on the beach with tiki torches for lighting.